Provide comfort for the family of Nancylee Gray with a meaningful gesture of sympathy. Nancylee H. Gray, 77, of Honey Grove, passed away at 2:06 PM on Monday, February 18, 2019 at her residence. She was married to her late husband, Raymond B. Gray, with whom she was blessed to share many years of marriage before his passing on December 30, 2004. Nancylee was a 1960 graduate of Tuscarora Valley High School. 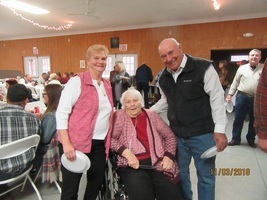 In addition to working beside her husband on the family farm, she was employed as a Sales Clerk with Foss’s Jewelry and Mac’s Clothing, both of Mifflintown. Mrs. Gray was a member of the Port Royal United Methodist Church and the Red Hatters Society. She is survived by her son, Raymond Lee Gray and his wife Kimbra Jo of Honey Grove; eight grandchildren, Heather Leigh Imes, Rachel Arlene Murphy and her husband Michael, William Lee Gray, Shelbylynn Kilmer and husband Nathan, Darwin Tyler Long, Travis Banks Long, Casey Ann Gray, and Samantha Rae Gray; and four great-grandchildren. In addition to her parents and husband, she was preceded in death by a son, Norman B. Gray; a daughter, Cynthia J. “Cindy” Long; and a daughter in infancy, Karen Ann Gray. Funeral Services will be held at 10:30 a.m. on Friday, February 22, 2019 at the Brown Funeral Homes, Inc., 100 Bridge St., Mifflintown, with Pastor Barbara Inch officiating. Interment will follow at Old Church Hill Cemetery, Port Royal. A viewing will be held from 6-8 PM on Thursday, February 21, 2019 at the funeral home. In lieu of flowers, memorial contributions can be made in Mrs. Gray’s memory to a charity of the donor’s choice. To send flowers in memory of Nancylee H. Gray (Horning), please visit our Heartfelt Sympathies Store. We encourage you to share your most beloved memories of Nancylee here, so that the family and other loved ones can always see it. You can upload cherished photographs, or share your favorite stories, and can even comment on those shared by others. Provide comfort for the family of Nancylee H. Gray (Horning) by sending flowers. Lee and Katie, My condolences at your loss. Remember the good times and forget the bad, She's at a better place now. Robert Burns " Bobby"